Cats who live on the streets often have something in common. They produce lots of kittens. 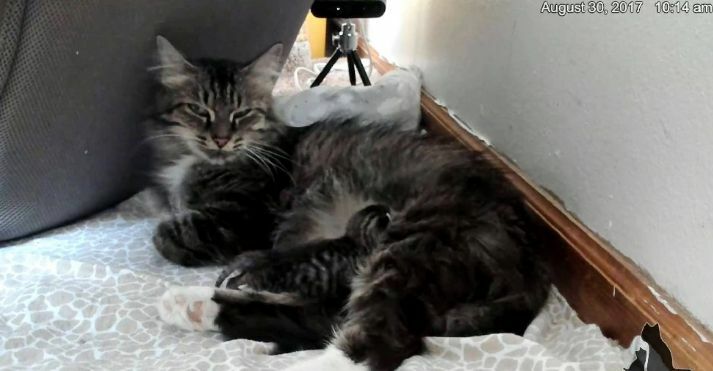 Such was the case with 2-year-old Shelby, a pretty tabby cat with a white bib and huge green eyes who gave birth to a litter of kittens in Arlington, Washington. A friendly Good Samaritan provided food for her while she was feeding her little family. 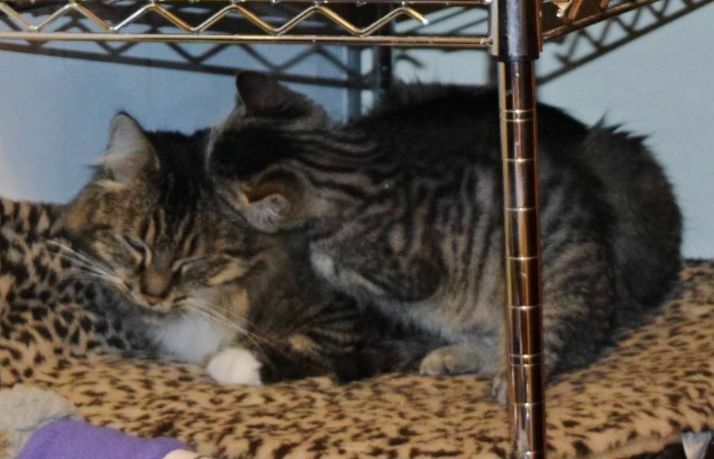 When the kittens were a bit older, the kind folks at Purrfect Pals Cat Rescue took in the whole group and began taking care of them. Of course, one of the first things volunteers did was put the mama cat under the care of John, an experienced foster dad from The Critter Room. And right away he took her to the vet to have her spayed. 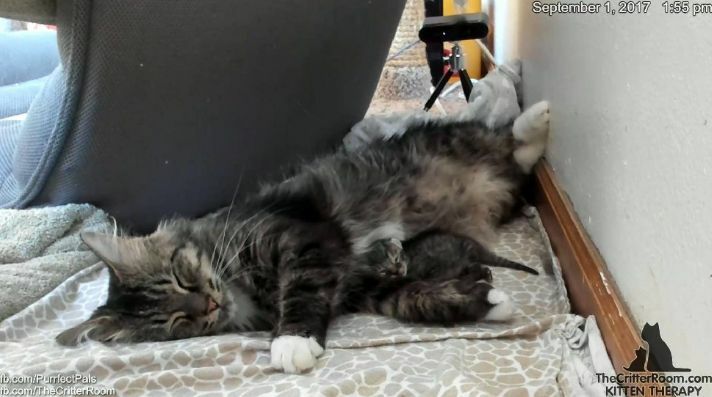 Although everyone thought her previous kittens were her last, a surprise was in store for them. Shelby was carrying another litter! This time, Shelby wasn't so lucky. Three of her four kittens didn't make it through the birth process, and the fourth was very tiny and weak. 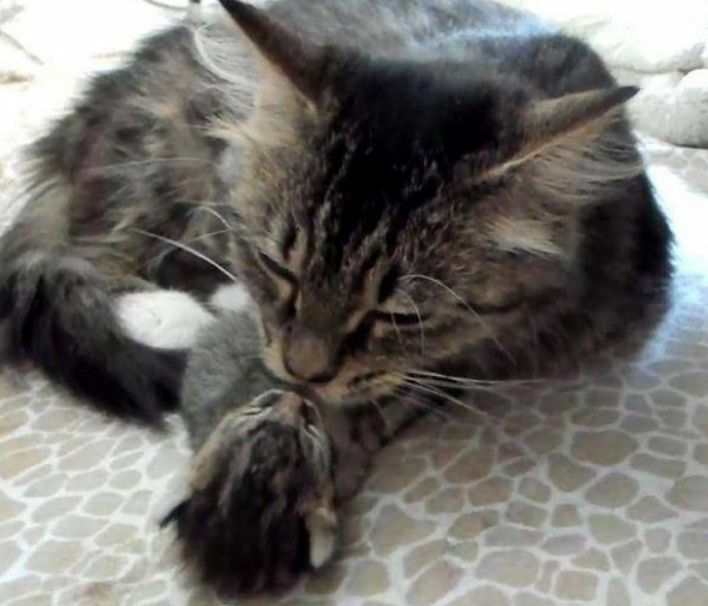 Shelby did her best to feed and care for the baby, named Sparky, but sadly, on the fourth day, the kitten crossed the Rainbow Bridge to join his other siblings. That's when the real surprise happened! 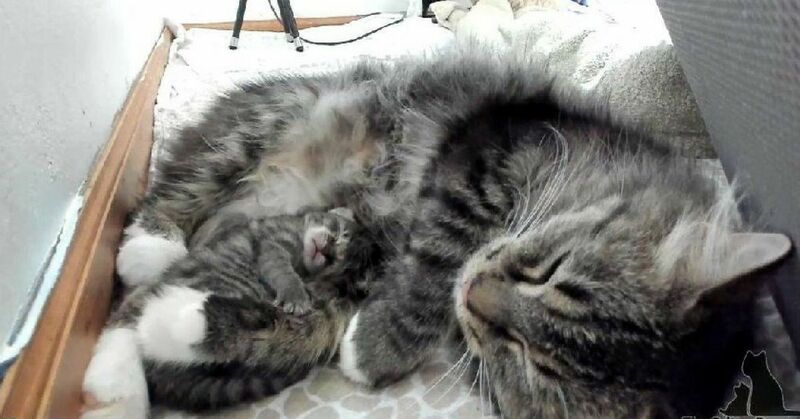 Right after Sparky died, on the way home in the car, Shelby surprised John with the birth of a fifth kitten. 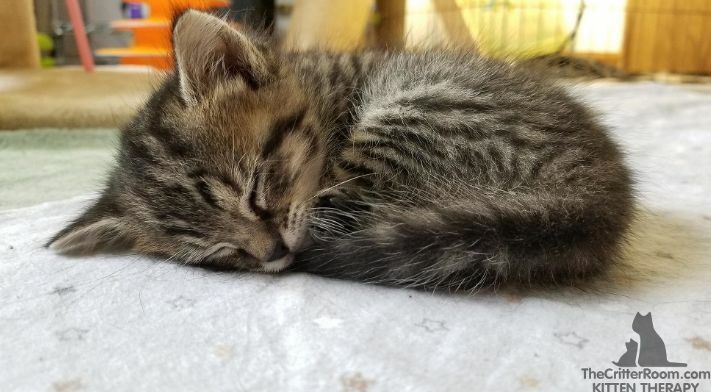 The tiny ball of fur would be Shelby's very last baby, and she was comforted over the loss of her other babies with this new one. It wasn't an easy start for the kitten John named Lizzie (after the Model T car). She was so little, but her extra time inside her mama helped her survive. Naturally, the two became inseparable. 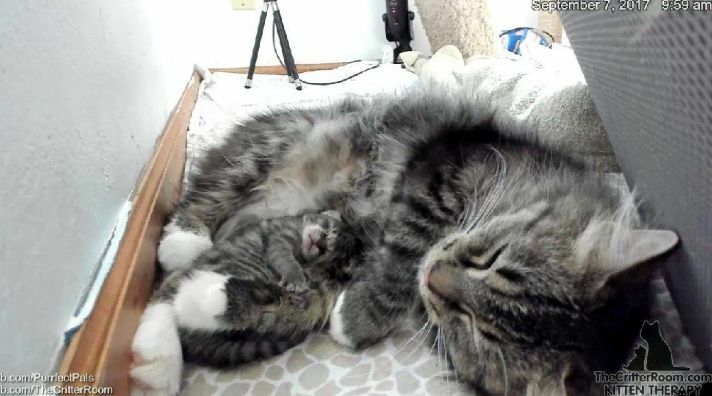 Without littermates to cuddle with, Lizzie spent all her time snuggled close to her mom. Shelby didn't let the kitten out of her sight, pouring all her mother-love into her minuscule infant. Lizzie was so tiny that even small advances were celebrated. But by 15 days old, Lizzie was starting to make great strides. "Her gains may be smaller but they're steady," John said. Her tiny body got stronger by the day and she hurried to mama every time Shelby called her. Soon enough, Lizzie's personality came through. She loved climbing, and everything was fair game, including the pant legs of volunteers. Shelby might be the grownup of the pair, but she played like a kitten herself. 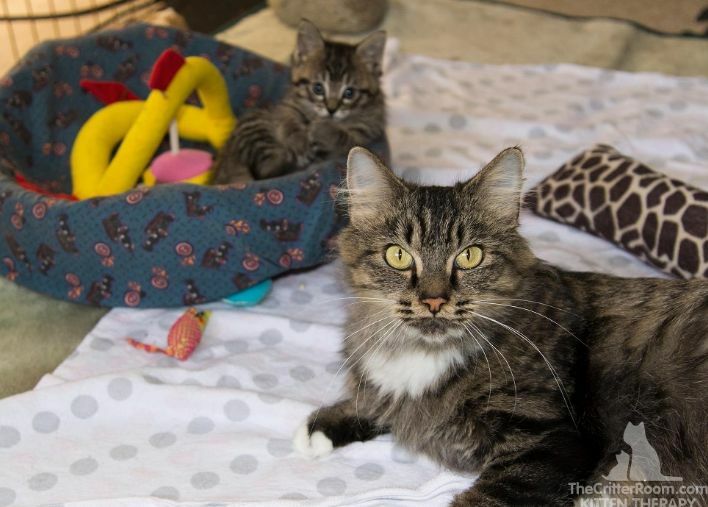 Eventually, the day came when Shelby and Lizzie were ready to find a "furever" home. The one condition: They must be rehomed together. 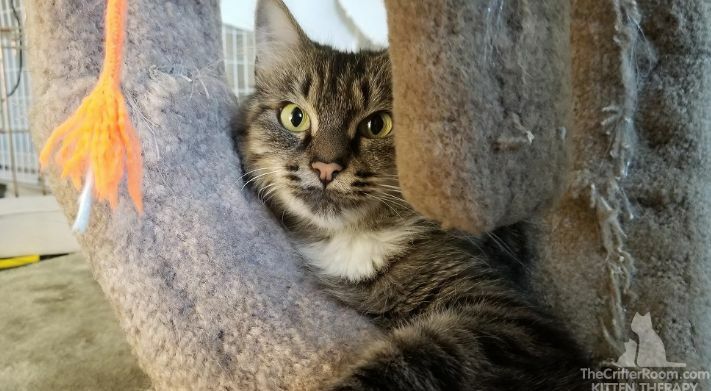 Shelby and Lizzie found their furever home with Hurricanes and Hot Rods and now have two other feline friends to share their lives and adventures. And the adventures do go on! Little Lizzie and her wonderful mom will never be parted again, thanks to the coordinated efforts of a bunch of people who value the lives of critters in our world. Do you have a little extra room in your life? How about becoming a foster mom or dad for a needy pet? Contact a rescue group in your area and see just how rewarding it can be.